Suraj Shakya, a French speaking tour guide was a fan of journalist Narayan Wagle’s column, Coffee Guff, in Kantipur. He never missed a column, which was written in Wagle’s characteristic breezy, colloquial style. 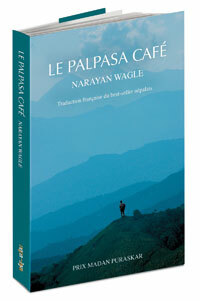 When Wagle’s first novel, Palpasa Café, came out in 2005, Shakya immediately bought a copy and read it within two days. The novel is set during Nepal’s Maoist conflict, and Shakya was eager that his French-speaking clients also read it. Shakya started translating the book himself and when he got to Chapter 25, started collaborating with several teachers of Alliance Française of Kathmandu to help him edit the draft. Everyone was doing this voluntarily, so it took Shakya several years to finalise the script. 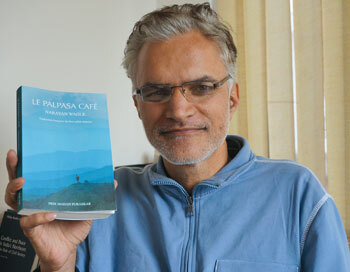 In the meantime, the Nepali version of Palpasa Café became a best-seller with 50,000 copies sold and the book had been translated into English and Korean. Kiran Shrestha of Nepa~laya, the publisher of Palpasa Café, was interested when he found out that Shakya had already gone ahead with the translation into French on his own. “It was great, but we needed a native French speaker to look at the book,” he said. Last year, French Isabelle Lippitsch attended a talk by Wagle at the Kathmandu International Mountain Film Festival (KIMFF). “While reading the English version of Palpasa Café, I really wanted to meet Narayan Wagle in person,” she told Nepali Times and was enthusiastic about translating his book into French. At the launching of the book at Alliance Française this week, Lippitsch said that she wanted to be involved so Nepal conflict would be better known in France. “If one isn’t really interested in the history of the country, he won’t know what the sufferings of the people have been during this tragic episode,” she said. Only a few books of Nepali literature, like Parijat’s Blue Mimosa, had been translated in French so far. Kiran Shrestha sees this new translation as an experiment. Even if he printed only 1,000 copies of Le Palpasa Café, he believes in its success. “We hope we can bring the Nepali literature to an international readership,” he said. One step forward, how many backwards?